Prepare for the activity by creating the small world. Dye your rice by placing 3-4 cups of rice inside the Ziploc bag. Add in 2 teaspoons of vinegar and a few drops of green food coloring. Shake the bag until all the grains are covered. Empty the rice onto a covered cookie sheet and allow to dry overnight. Repeat this process with blue food coloring (this will represent the water in the story). Place the dried rice along with the leaves, flowers, rocks, and figurines in the plastic bin. Read The Grouchy Ladybug with your students, stopping periodically to discuss elements of the story, including characters, setting and plot. 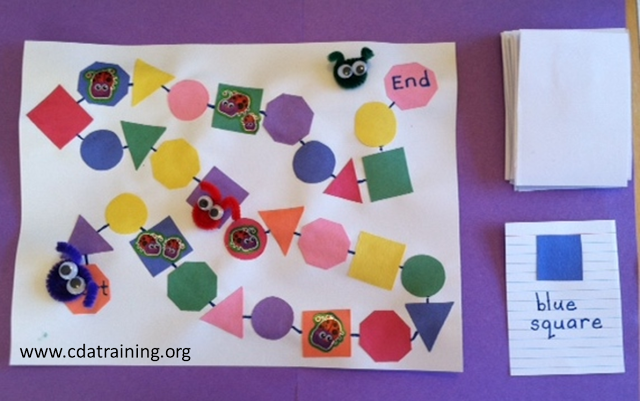 Encourage students to play in the small world bin. As they are playing, prompt them to retell the story by asking questions. Observe and record the student’s retelling skills. Were they able to name some of the characters, setting, and plot line? You can read the story with them again during the week and re-assess students to document growth in this skill. Materials needed: Construction paper of many colors, scissors, glue, stickers, pipe cleaners, wiggly eyes. Game pieces: Fold a pipe cleaner in half. Wind the pipe cleaner in a coil with the open points out. Curl the end up like antennae. Glue wiggly eyes. Instructions: Cut out circles, squares, triangles and octagons. Index cards cut in two, colored markers, laminate or contact paper. Cut out several small shapes in different colors. 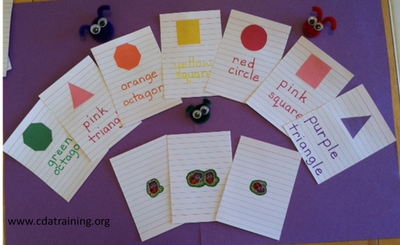 Apply a shape of each color on ½ of an index card. Label the card in the correct color with the color, and shape. Put bug stickers on 4 cards. 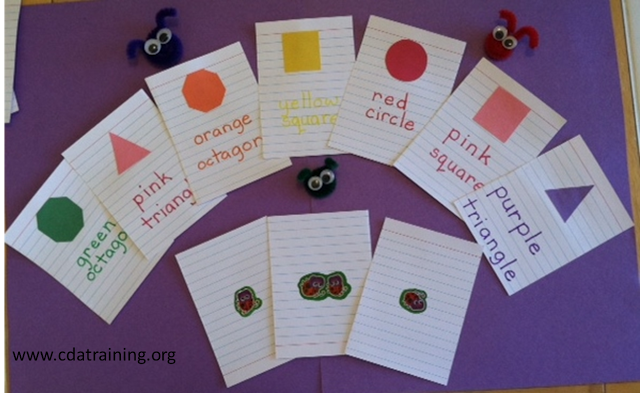 Arrange the other shapes in a wiggly line on a blank piece of construction paper. To Play: Set the cards upside down next to the game board. Have the child choose a card, read the card together. Play by color or shape. 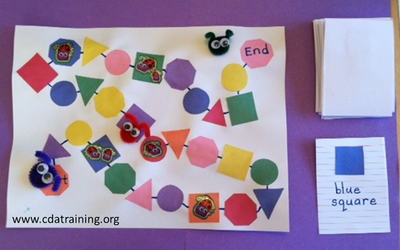 Child moves bug game piece to chosen color and shape.